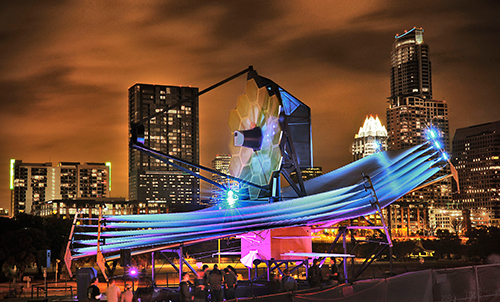 Astronomers and planetary scientists debate if and when we’ll find extraterrestrial life. The event: an Oxford-style debate. The occasion: a celebration of the Department of Astronomy and Astrophysics’s 123rd year, in conjunction with the University of Chicago’s 125th anniversary last fall. The place: the William Eckhardt Research Center, the department’s new home. The proposition: by the end of 2042—significant for being 150 years after the department’s founding—remote sensing will reveal evidence of extant life on an exoplanet. The fine print: we don’t have to physically visit the site; evidence does not mean certain proof; organisms must be currently living; and life forms need not be intelligent. The winner: to be determined by audience vote. The finer print: the debate deals with life as we know it; alien life could be so alien we might not even recognize it. Dorian Abbot, Associate Professor of Geophysical Sciences Abbot launched the arguments for why we would find life with five points supporting the claim that life is common, particularly microbial life. Earth-like terrestrial planets are plentiful in the universe, as revealed by the Kepler mission, offering ample opportunity for habitable environments. “The raw materials for life are everywhere,” said Abbot. Hydrogen, oxygen, carbon—they can be found on asteroids, moons, other planets, and in interstellar space. Life thrives on Earth in extreme conditions, like in hot springs and deep-sea vents and Antarctica. Life is resilient. “Once it arises, it’s hard to get rid of,” said Abbot. Asteroid impacts, hothouse climates, and “snowball Earth” events that froze the entire planet—despite mass extinctions, microbial life has persisted. Leslie Rogers, Assistant Professor of Astronomy and Astrophysics Rogers discussed how we would detect life through observation and measurement of biosignature gases. “Even simple life will modify its environment,” said Rogers. “No matter how ‘green’ these aliens are, they will inevitably pollute.” The question is whether that pollution will be detectable and distinguishable as a biosignature rather than from an abiotic process, like volcanic activity. The key will be finding an ideal biosignature gas to look for. Water, methane, and carbon dioxide all arise from geophysical processes. Astronomers must find a molecule that doesn’t exist naturally in a planet’s atmosphere, is not created by planetary processes, is not produced or destroyed quickly by interaction with light, and has a strong enough spectral signature to be detected from a great distance. If an alien species were looking for an ideal biosignature from Earth, O2 or ammonia would fit the bill. Laura Kreidberg, SM’13, PhD’16, NSF Graduate Research Fellow in Astronomy and Astrophysics (now at Harvard) Kreidberg addressed technology: “The million dollar question is, will we actually be able to detect these biosignatures by 2042? Actually perhaps more likely the 10 billion dollar question.” She explained the main technique used to analyze atmospheres, called transmission spectroscopy. When a planet passes in front of its star from our perspective, molecules in its atmosphere absorb light, producing an observable spectrum, from which astronomers can infer the planet’s atmospheric composition and temperature. Edwin Kite, Assistant Professor of Geophysical Sciences To kick off the arguments that we won’t find evidence of life, Kite considered the likelihood of life arising from chemical reactions. “We all hope that life is widespread in the universe; anything else would seem like a waste of space,” said Kite. “But we should vote based on facts, not hopes, and the facts are that the origin of life appears to be very difficult.” Scientists have known since Pasteur’s 1859 experiment that spontaneous generation doesn’t exist, and all efforts to coax life from its necessary components in a laboratory have failed. Nearby planets and moons have had all the prerequisites for life in just the right conditions for millions of years, and still no life has arisen. Edelfelt, Albert. 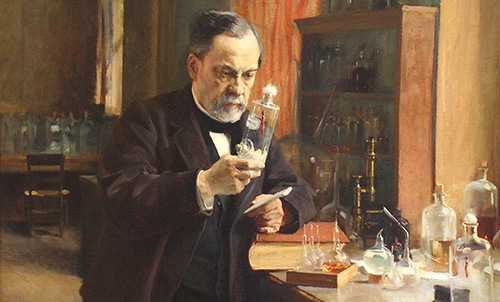 Louis Pasteur. 1885. Oil on canvas. Musée D'Orsay, Paris. The rise of life isn’t impossible, Kite noted, because it obviously has happened at least once in the universe. So he laid out two scenarios: life is easy and common (which seems unlikely considering our failed experiments at creating life and nearby observation) or life is rare, spread out across swaths of lifeless space too vast to overcome any time soon. He insisted that the audience shouldn’t feel any cognitive dissonance in voting no. They can still support exoplanet research while acknowledging that it’s unlikely to find alien life by 2042. Daniel Fabrycky, Assistant Professor of Astronomy and Astrophysics Fabrycky’s discussion on whether we’ll find simple life centered on whether we might find—or be found by—intelligent life. He conjured Fermi’s paradox, often mentioned when discussing alien life. 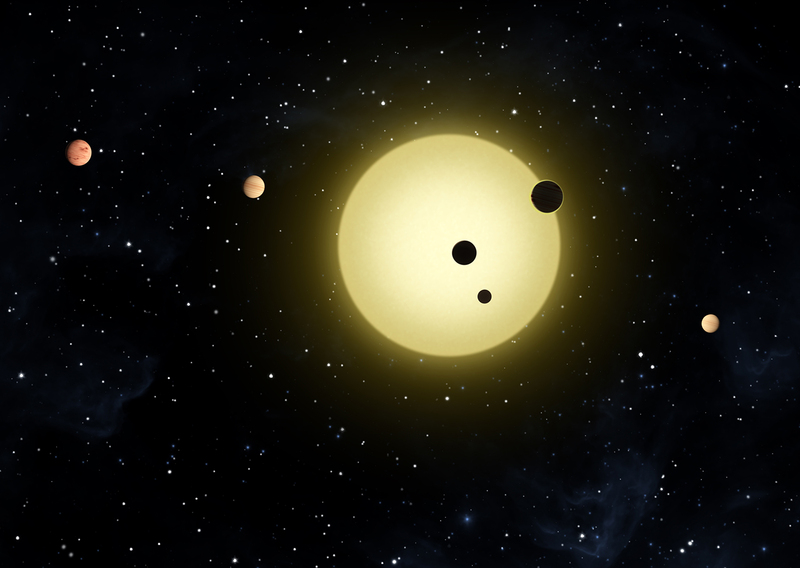 Put simply (and perhaps incorrectly): If aliens are out there, where is everybody? Why are we not in contact now, and if they’ve visited, why are there no artifacts? “In this audience, I don't think I have to defend that proposition—that there are no such artifacts,” said Fabrycky. “Not even a measly obelisk on the moon.” Fabrycky pointed out that our solar system has traveled around the galaxy 50 times since it formed, with only the help of gravity. “If you have rockets and intelligence propelling you, you can get around the galaxy much quicker.” If aliens were coming, they should be here by now. For contact to be made, a series of states must be achieved, according to the Drake equation. There must be terrestrial planets older than Earth. Nonliving molecules must form into living, replicating organisms. Life must evolve from simple organisms to complex, intelligent life. Intelligent life must develop technology advanced enough to populate the galaxy. Before the debate, the audience voted 38 for yes, we will find life; and 33 for no, we’re on our own. Afterwards, 38 for yes, 40 for no. Astronomy and Astrophysics chair Angela Olinto joked, “I think we are following the Chicago tradition of voting often,” before declaring a tie. Before appearing in the Fall/16 issue of Inquiry, this story was originally published online May 9, 2016.